The first signs of a big year were there even before the playing season began. 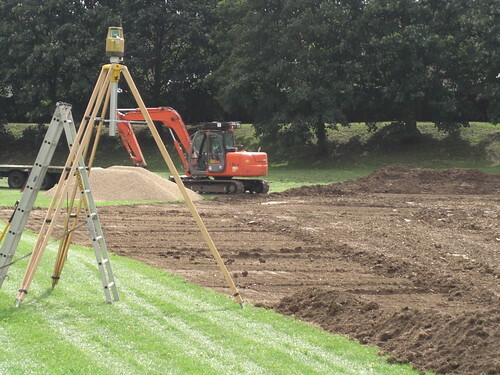 The club had worked hard and raised money for years with the aim of laying a second diamond, so that the facilities would expand to match the numbers of players now turning out for the club. The grass on the new diamond had been laid last autumn, and in the Spring a bevy of talented ball-players turned out to help prepare the infield. The local police and the Mayor joined in for an operation which also involved a digger, a tipper truck, and mounds and mounds of gravel. The field was christened in competitive games in late May – fittingly the Little Leaguers were the first to enter the new era, with the Raptors staging a dramatic finale to the weekend in a nailbiting 31-30 defeat by Tonbridge. The arrival of the second diamond meant the club could add several more firsts to the list for 2010. It was the venue for a new National League event, the Summer Classic, which saw all the teams playing competitive games at the same venue on the same day. And above all, Herts was able to host the National Baseball Championships for the first time. In September, clubs from Liverpool, Leicester and Richmond were among those joining Herts very own Eagles at two days of often thrilling baseball. It was a big step for the club on the national stage, and we will hear more about those Eagles later…. Before we move on to the details of the playing, we must pause briefly to marvel at the fact that the BBC allowed us to grace one of its flagship television programmes this year. In April, Mike Bushell from the BBC1 Breakfast show came to Grovehill to take part in a training session with Little League players and National League Falcons alike. It was all caught on camera, and won attention for the club and the sport across the UK. Mike gamely tried to field some fly balls, and tried to hit a Dan Kerry fastball — with a predictable lack of success. But he did really hit the balls that you see in the film, and ran the bases with enthusiasm. And so to business. The Falcons would be the first to tell you they were disappointed with a 9-19 record. But there were struggles in both the pitching and the hitting departments, meaning that it was hard to put together a good run. Despite all of this, the Falcons fought to the very end of the season for a playoff place, and were only denied by a sweep by the Mildenhall Bulldogs in the final series of the season. And there were plenty of highlights. The brightest of them was the superb 2-1 win against the champions, Richmond, and their MVP pitcher Cody Cain. A home run from Kimiyoshi Saionji helped secure a famous win. The infield defense was perhaps the strongest part of the team, and Pete Kikel went from rookie upstart to established National League pitcher and hitter in just one year. The Falcons also added the big bat of Alex Ganster late in the season, and they are looking forward to fighting back next year. The Eagles in the AAA division were Herts’ most successful adult team. Helped by the pitching of Darrin Ward and Louis Hare, and the ability to keep a consistent line-up together, they notched up an 18-6 record to qualify for the playoffs. 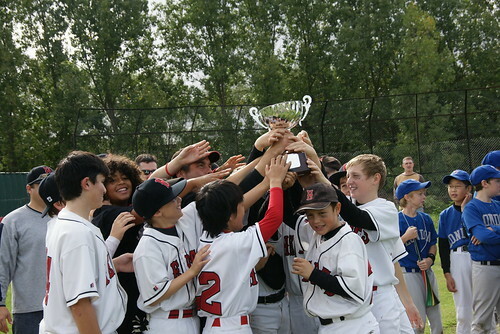 Further victories ensured they would represent Herts at the first ever National Baseball Championships at Grovehill. They battled through to the semi-final to take on the ultimate champions, the Oxford Kings, but were undone in a game which turned on a controversial umpiring decision. The Eagles manager Lee Manning – who had represented his team with vigour all year – was justly proud of what they had achieved. The Hawks had a tougher time of it, facing teams in the AA division who probably belonged higher up. Greg Bochan led the team in his customary spirit, and they always competed hard, even having been ruled out of post-season contention. They ended the year with a 5-13 record, claiming wins over Croydon, Brentwood and Horsham. Youngsters Perrie Sherman and Hunter Devine provided plenty of spark, while Simon Langton was a strong defensive addition in his year in Hertfordshire. The Raptors had the worst record of any Herts team, but as a genuine development squad – packed with complete rookies – winning was not the measure of their achievements. It was all about learning and improving. They were thumped more than once, but also narrowly lost spectacular games against the Tonbridge Bobcats and the Chelmsford Clippers. The Raptors’ one win of the season was on the road on a blazing hot Fourth of July, against the then-division leaders, the Braintree Rays. The shock 22-18 victory made the news in reports across the country, being described as “one of the results of the season” in British baseball. Players who had never before pulled on a glove – Jim Arnott, Bryan Drummond, Will Belbin – grew in stature as the season went on. The Raptors manager, Ken Pike, hopes to keep the core of the team together and secure a winning record next year. Finally we move away from the adult teams, and on to the even brighter news about the future of the Herts Baseball Club – the youngsters. Another successful Little League summer came to a climax when the Herts All-Stars won the Little League National Championship in September. They reversed last year’s 1-0 defeat by the London Mets, beating their biggest rivals 2-1 to claim the crown. The All Stars went through their entire season unbeaten. It was a proud moment for the club, and for the large numbers of parents and coaches who regularly turned out to help the boys and girls develop their skills. And the National title was not the only good news for the youth programme. 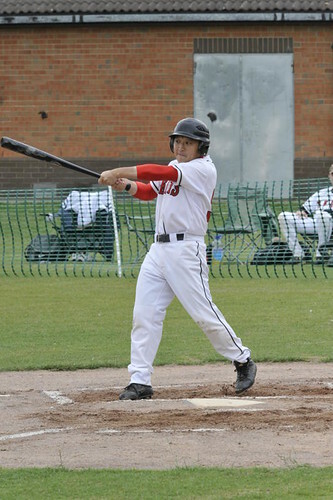 Liam Green, who only took up baseball when he became a founder member of the Herts Little League in 2007, was called up to the GB squad which went to the European Championship qualifiers in Sweden this summer. And the club showed its commitment to youth in a quite extraordinary way – all four team managers had babies in the 12 months from the end of the 2009 season. Can any other club boast that sort of commitment? OK, maybe the managers didn’t actually have the babies – everyone knows the managers don’t do the hard work – but Sebastien, Riley, Nathan and Violet all have great futures ahead of them. Their parents adapted admirably to the challenges they face, and the family atmosphere at Grovehill was enhanced. Herts Baseball Club is looking forward to 2011 with confidence.